Feb 11, 2013 by Jason Newcomb Comments Off Posted In: Say What?! Here’s another ad from an old romance comic that is sure to improve your self esteem along with your ugly body. Who needs exercise, proper nutrition and common sense when you have the “Magic-Mold Wonder-Zip”? Hey, it’s hyphenated so it must be great! It’s the same wonderful product that you’ve seen in the massively popular magazines “Charm” and “Glamour” and other publications that will be rendered laughable in a few decades when “Cosmopolitan” will drag women’s self esteem to record shattering lows! 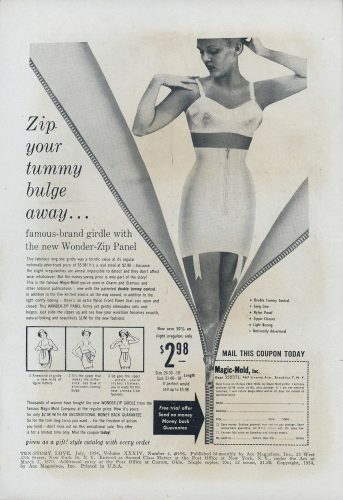 So you best pounce on this deal and slim your waist before Wonder-Zip’s evil step daughter, Wonderbra, comes along to point out how not only are you too fat around the middle you’re also not fat enough around the top. Have fun hating yourself! • A free catalog! Hooray for consumerism! 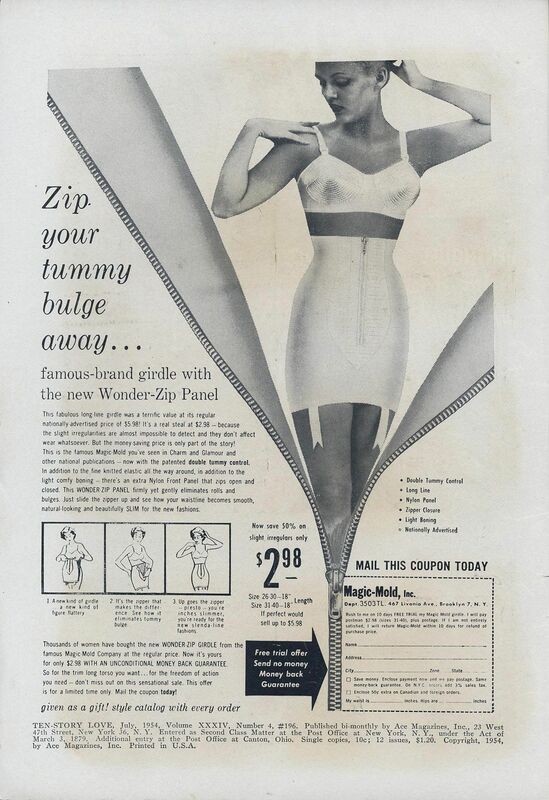 • A “Nylon Front Panel that zips opens AND closed”! Oh my! I sure am glad it does both! Teehee! • A “light comfy boning”. Yes ma’am, everyone loves a good “boning”, especially a “light and comfy” one.